NEW YORK, JANUARY 22, 2018 - HOT 97’s Who’s Next is back for its latest installment launching on Tuesday January 23rd, 2018 at the legendary New York live music venue, SOB’s. 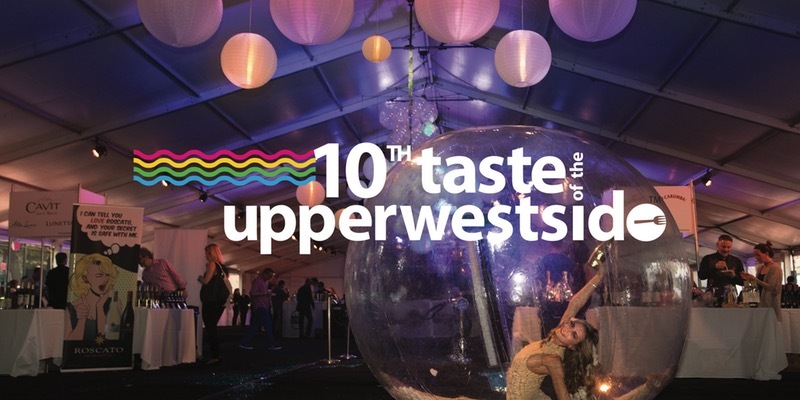 The event will be hosted by celebrity radio personality Shani Kulture. 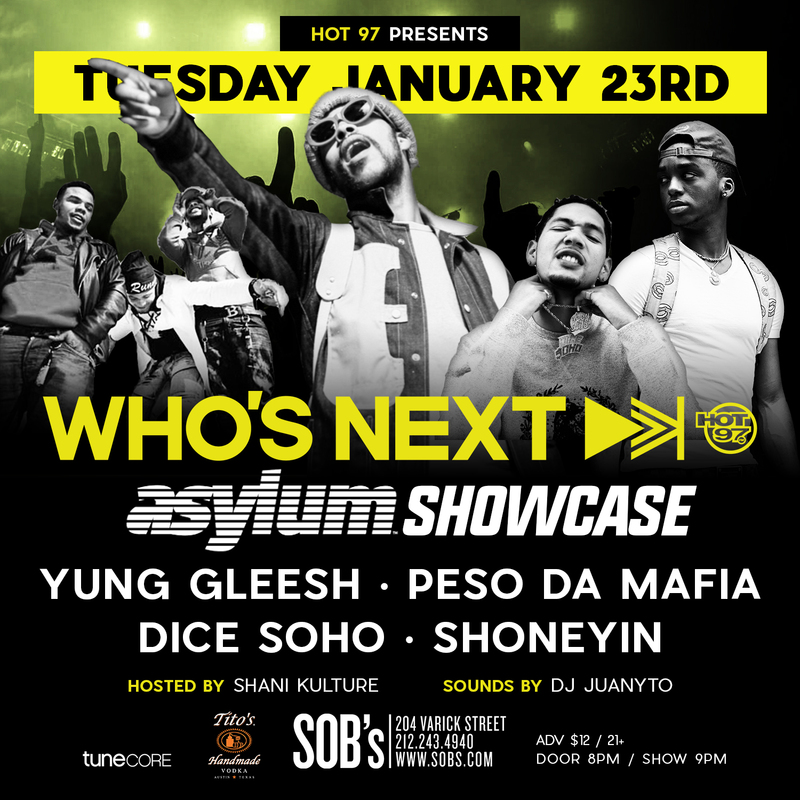 This month, Asylum Records’ Yung Gleesh, Peso Da Mafia, Dice Soho and Shoneyin will take the stage. Doors open at 8pm ET and the showcase promptly launches at 9pm ET. FOR IMMEDIATE RELEASE New York, NY (September 14, 2017) – Mondo.NYC, a Global Business Summit and Music Festival has announced its full agenda and artist showcase schedule for its second annual five-day event. By day, Mondo.NYC is an incubator for the music and tech industries and by night, is a platform for emerging artists from around the globe to perform at Manhattan’s key independent venues. Join us on October 4-8, 2017 where we aim to connect fans and creators in a shared mission of empowering artists and advancing ideas in an ever-changing music business. This year Mondo.NYC partners with The New York City Mayor's Office of Media & Entertainment, Recording Industry Association of America (RIAA), New York University (NYU), Spotify, international export agencies, and multiple additional partners to present a comprehensive program for industry, artists, media, and fans. New York University will host the daytime business summit, with nightly showcases and after hour meetups headquartered around the legendary Rockwood Music Hall. 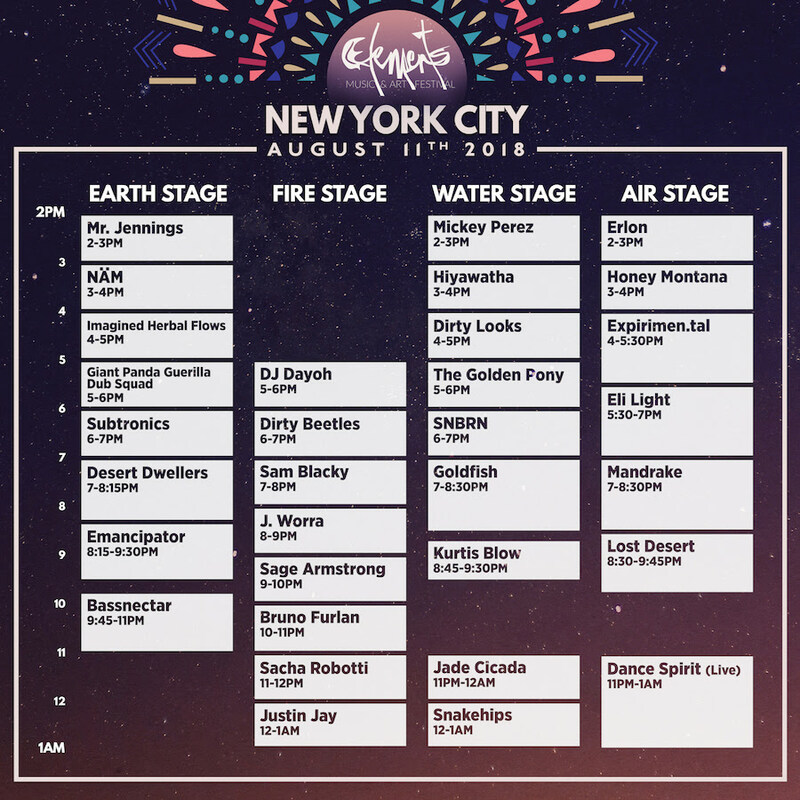 Artists will perform across Rockwood Music Hall’s three stages, in addition to a host of other iconic Manhattan and Brooklyn independent music venues including Bowery Electric, Pianos, The Delancey, DROM, Berlin and Brooklyn Bowl. Highlights among the expected 150+ Mondo official showcasing artists include: Harrison Storm (Australia), Laura Sauvage (Canada), Brass Phantoms (Ireland), The Skins (USA), Eli Tyler (USA), MANU LANVIN (France), RIVAH (Australia), In Hoodies (Turkey), Alpines (UK), Stealth (UK), Tusks (UK), Christopher The Conquered (USA), Carnival Youth (Latvia), Birthday Club (USA), Austerity (UK), Jeremy And The Harlequins (USA), DillanPonders (Canada), Supercel (USA), William Crighton (Australia), BARQ (Ireland), Talos (Ireland), The Gold Magnolias (USA), Angel Snow (USA), Frank Bell (USA), Luke Yeoward (Australia), Shy Kids (Canada), Mt.Wolf (UK), Tokyo Taboo (UK), Girl Skin (USA), Merci Raines (USA), Climbing Trees (Wales) and many more. “New York City - The Opportunities & Challenges,” in partnership with The New York City Mayor’s Office of Media & Entertainment (MOME), Wednesday, October 4th at 2pm, addresses navigating New York’s music ecosystem, providing resources and recommendations for approaching NYC’s vast yet overwhelming infrastructure. RIAA Programming Partnership & Spotify-Hosted Reception: The RIAA will discuss its mid-year industry revenue numbers during a special presentation on Thursday, October 5th as part of a discussion titled “Streaming Revenue & Policy in One Hour,” featuring Cary Sherman, RIAA CEO, Mitch Glazier, RIAA President, and Joshua Friedlander, RIAA SVP Strategic Data Analysis along with key industry representatives, to be immediately followed by a reception at NYU co-hosted by Mondo, the RIAA and Spotify. Can Washington Help The Music Industry Move Forward? Who Are the DMCA Safe Harbors Saving? Streamripping – The New Threat? Please note all Mondo.NYC 2017 events are subject to change. Stay on our socials for constant updates and additions or connect with us on our app (iOS / Android)! Pre-Registration Discount badges: Tickets are on sale now through Mondo’s exclusive ticket partner Eventbrite. Click HERE to take advantage of Mondo’s early and student discounts at pre-registration prices. NYU Partnership: New for 2017 is The Mondo Sessions @ NYU, a groundbreaking multimedia music discovery and marketing partnership with NYU Steinhardt. NYU music business students and faculty team up with Mondo for a semester-long program integrated with the Village Records course to identify, support, and help advance the careers of two emerging artists chosen from among Mondo performing acts and artists submitted by Steinhardt students. The Mondo Sessions will be highlighted with a panel and live music showcase from the selected artists as well as a recording session at NYU. DIY, London based music discovery media platform: Over the past decade DIY has built a reputation for discovering and nurturing acts from all over the globe through partnering with showcase festivals, creating an international media brand to support emerging artists providing access to its increasingly global audience. The Marauder Radio Room @ Mondo: is a chance for college students from attending radio stations to be involved in the hands on experience of running, organizing, and recording of interviews and exclusive live sets from showcasing artists for their stations during Mondo.NYC 2017, at the Rockwood Music Hall. Mondo Hotel HQ: Mondo has partnered with Ian Schrager’s brand new Lower East Side Public Hotel, an extraordinary new landmark in the heart of NYC’s Lower East Side, located at 215 Chrystie Street. ClickHERE for reservations. Music Glue: Our exclusive Apply to Play partner for Mondo.NYC 2017 is Music Glue. Music Glue is a specialist e-commerce platform for the music business that makes it easy for fans to buy music, merchandise, tickets and experiences directly from the artists they love, in one simple transaction. Artists, managers, labels, merchandisers and promoters use Music Glue to control their online presence and e-commerce with ease, owning their data and selling anything, to anyone, anywhere, via any device, in over 25 languages and currencies. Music Glue was founded in 2007 and is global, with offices in London (HQ), New York and Sydney.